Berks Catholic played West York tonight for the fifth-spot in District III-AAA hoops. With Monday’s win over Lancaster Mennonite, the Saints looked to stay hot for fifth-spot contingency. West York struck first with an early 2-0 lead over Berks Catholic with 6:20 remaining in the first quarter. The Saints responded, drawing a 1 point lead over the Bulldogs with 4:22 remaining in the quarter. Berks Catholic continued on a run, taking a 13-9 lead with 1:55 left, forcing a West York timeout. 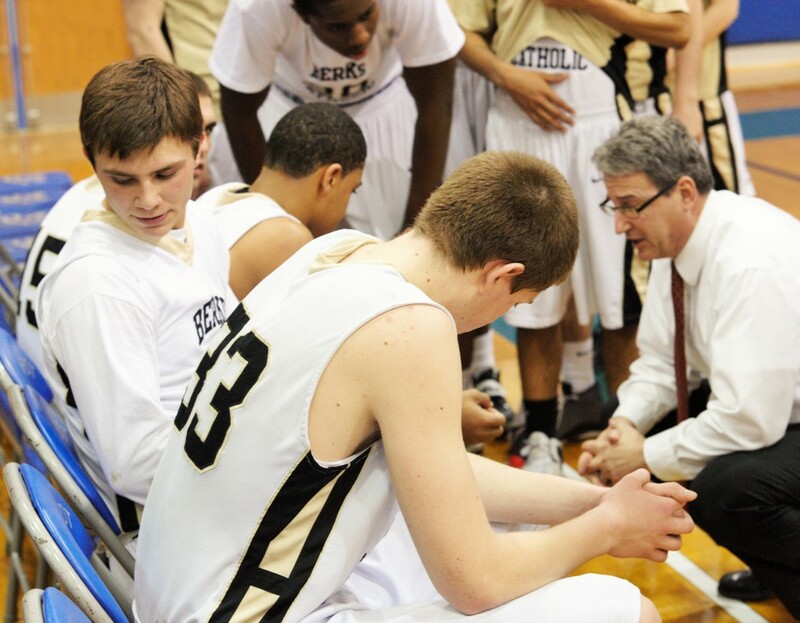 After 1, Berks Catholic lead 15-13 over the Bulldogs. Berks Catholic continued on the assault, tossing up a 17-13 lead over West York with 5:36 remaining in the second quarter. Nana Foulland’s numerous missed attempts required an early reassessment in the quarter. Foulland would sit for a majority of the second. At half, Berks Catholic lead West York, 22-15. The Bulldogs struck big early in the third quarter and land consecutive three-pointers to draw within 2 points of the Berks Catholic lead. With 5:34 remaining in the quarter, the Saints held a marginal 26-24 lead over West York. However, Foulland began to cash in from underneath, striking for eight points late in the third. The Saints continued to lead after 3, 35-29. West York surged mid-way through the fourth quarter, pulling within 1 point of the Saint’s lead with 4:19 left. 30 seconds later, the Bulldogs tied 41-41. West York brought the score to 45-42 over Berks Catholic with 1:42 remaining. Berks Catholic dug, taking to score to 47-47 with under a minute remaining. With 6 seconds remaining after Bulldog’s timeout, West York failed to capitalize on an offensive possession and the game headed into overtime. Berks Catholic’s early OT lead proved too much for West York to come back from. After 4 and OT, Berks Catholic won 59-54 over the Bulldogs. Foulland led with 20 points on the night.